A Better Version of Hot Dip Galvanized ? A Better Version of Hot Dip Galvanized Coated Steel? Zinc-Al-Mg Hot Dip Galvanized Coated Steel. 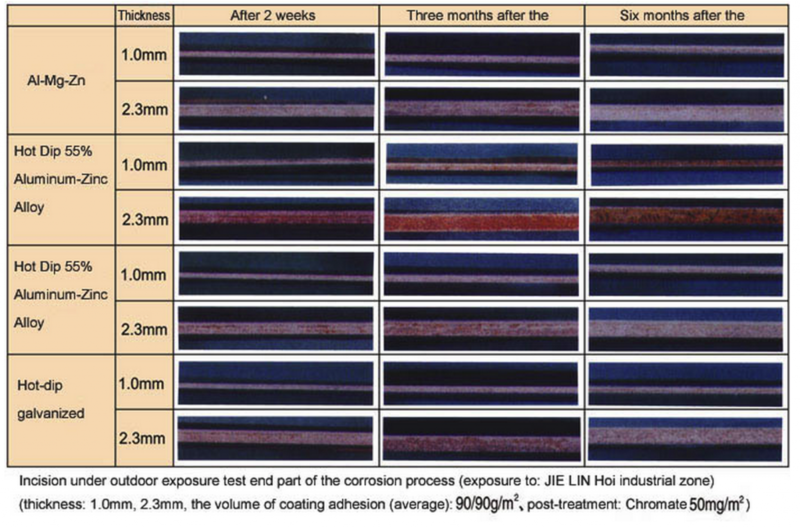 As the industrial world look into ways on how to protect against corrosion, there has been little education on how the coating industry has made progress in this field. Which explain the reason why in most major projects such as infrastructure, process industry, oil and gas and even building industries still maintaining the specification of the Normal Hot Dip Galvanized Steel requirement with average micron of 45-55 micron thickness coating. Even the Strangest things happen when manufacturer are told that their products is not acceptable and was asked to change to lower grade / much inferior Normal Hot Dip Galvanized Coated Steel from Zinc-Al-Mg Hot Dip Galvanized Steel. Of Course even with the more superior coating protection of Zinc-Al-Mg Hot Dip Galvanized Steel, there is a huge disadvantage when the materials need to be welded or exposed to hot works which may damaged the coating on the steel. Of which Post Hot Dip Galvanized Steel has a better protection when applied after the materials are welded or exposed to hot works. As you can see that as the years goes by the Coating reduction between the Normal Hot Dip Galvanized and Zinc-Al-Mg Hot Dip Galvanized goes even wider. This shows that over time Zinc-Al-Mg Hot Dip Galvanized Steel provide much better corrosion protection over the former Hot Dip Galvanized Process. Coating Thickness Due to its Batch HDG Process, it is Natural that the Coating Thickness is irregulars through out averaging 45 – 65 Microns for Steel Thickness of 2 – 2.5 mm Automatic Continuous Coating Line, the ability to have a consistent Coating thickness and better Coating Quality through out. Visual Since Post HDG Relied a lot on manual operations and the skill of the operations, Visual may be inconsistent through out the Product Surfaces. 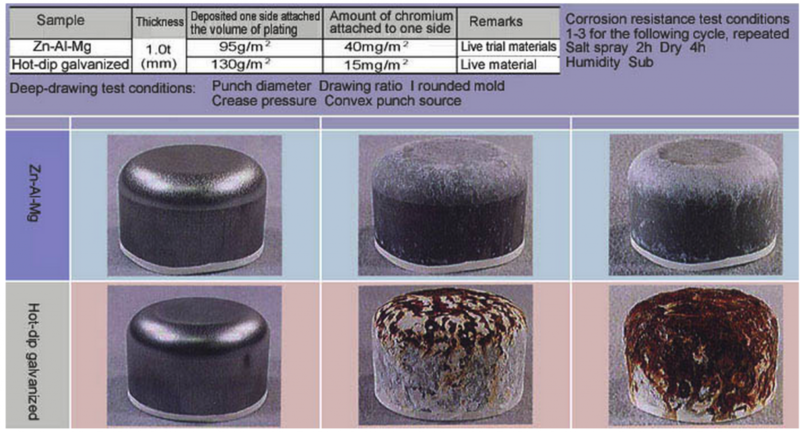 Problems such as Zinc Ash, Spots and rough surfaces and inconsistent spangles may be found in this process. Consistent Visual and Better Quality Visual Appearance.. Recent Studies found that No Spangles surface of HDG provide a better protection against white rust, although White Rust does not have any significant affect the quality of the Coating. Corrosion Protection Inferior Corrosion Protection with thicker Coating mass Superior Corrosion Protection with thinner coating mass. The Coating will be damaged due to the heat and after fabrication, repair to the coating must be done by cold galvanizing or Painting over the damage area with Zinc Paint which cause visual deterioration. Excellent Protection over Bended Area and Over Cut areas, the Coating can Leached to the Cut Area and give protection over the cut areas. Formed Part Significant Reduction of Coating Protection, especially when the Forming is Done after the Hot Dip Galvanized Process is done. Excellent Protection over Formed Area. Cost over Transport and Handling Higher as there is additional Handling needed to and fro the Hot Dip Galvanizing Process Lower as Materials are shipped pre-coated. Zinc-Al-Mg Hot Dip Galvanized Solution may provide a better solution to your Corrosion Protection needs with much economic value than materials such as stainless steel or aluminium.